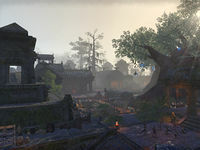 Dead-Water Village is a settlement found in western Murkmire. It is inhabited by the Dead-Water tribe, or as they call themselves, the Naga-Kur. Dead-Water Village Objective: Help save the Dead-Water tribe from extinction. Dead-Water Wayshrine can be found in the eastern part of the village. The merchant Jeetum-Lah, can be found wandering between Dead-Water Village and Blackrose Wayshrine. This page was last modified on 5 February 2019, at 00:56.